The third York beer census was on Saturday 18 June. Preliminary results show more than 300 unique real ales on sale in York. This is more than we found in 2014 showing that York continues to grow and develop as a great city of ale. We will crunch the numbers over the next week, so look out for more results soon. Thank you to all our volunteers who went out and about surveying York pubs. Thank you to the volunteers who stayed put and helped type in the information from those survey forms. 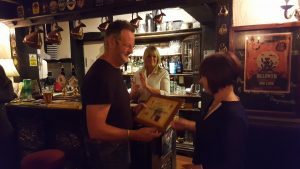 Finally we need to say very special thank you to Lee & Wayne at BrewYork for hosting the York beer census HQ, for their help in organising a great space to work and for their goodie bags and beer for all our volunteers that were really appreciated by all. Follow us on @yorkbeercensus for updates. This entry was posted in Beer Census, News on 26th May 2016 by Lucy. Read the full article on York Press. This entry was posted in Pub News and tagged The Micklegate on 19th April 2014 by York CAMRA. 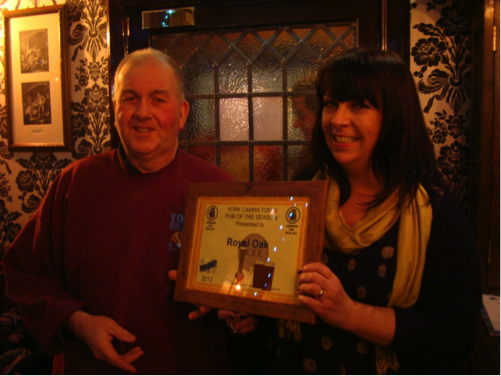 This entry was posted in POTS, Presentations, Pub News on 12th April 2014 by York CAMRA. Rumours on Mickelgate has been completely refurbished and now reopens as the Falcon Tap, a hark back to it’s historic name. This entry was posted in Pub News and tagged Falcon Tap, York pubs on 30th March 2014 by York CAMRA. This entry was posted in Brewery News and tagged Treboom on 19th March 2014 by York CAMRA. Ye Old Shambles Tavern re-launched itself in October 2013 after five years of trading as a gift shop and cafe. It is family run and has recently become licenced for on and off sales for its customers, supplying a range of Yorkshire ales. Bottled beer sales now cover over 60 labels from over 16 micro brewery producers, some of which are bottle conditioned so meeting CAMRA’s “Real Ale in a Bottle” definition. 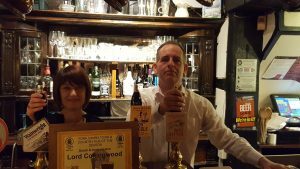 Managers Simon and Nicola pride themselves in offering a real Yorkshire welcome and are working hard to establish the Tavern on the real ale map. They have also installed two hand pumps serving beer from Rudgate and other local breweries. They are open seven days a week from 9am until late. This entry was posted in OB119, Pub News and tagged Rudgate, Ye Old Shambles Tavern, Yorkshire Ales on 25th February 2014 by York CAMRA. We arrived en mass at the Royal Oak to a very welcome warming fireplace! The pub’s regulars were also there in numbers most probably waiting for Two Bob to arrive and start playing and wondering why we were there, the large board outside advertising ‘Winner of CAMRA Winter Pub of the Season’ was the clue. The pub as always was very welcoming with a nice selection of beers: Hop Studio Porter, Treboom Tambourine Man, Brains Reverend James, Theakston’s Old Peculier, Theakston’s Best Bitter and Greene King Abbot Ale. After everyone getting their pints most having the two LocAle’s we moved into the larger back bar to perform the presentation. 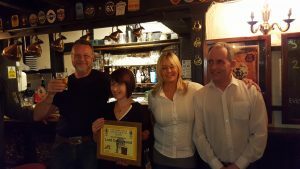 Sarah the licensee accepted on behalf the pub as she said in her acceptance speech the whole team from cellar, bar and kitchen have all helped earn the award. Gareth, Mike, Richard, Sam and Karl (the cellar apprentice and husband) all deserve a mention for their hard work in the cellar and the very onerous task of liaising with local brewers and tasting their brews! The pub will continue with its policy of trying to always have one bitter and one stout, porter or mild from a LocAle brewery with some of the speciality brews been fitted in when available. Hop Studio, Salamander and Treboom beers are firm favourites with regulars and visitors alike. The policy of offering third of a pint tasting trays is enticing people to try beers that they perceive to be outside of their comfort zone. Most manage to find at least one style of beer to their taste. The bar staff are all quite willing to discuss the beers on the bar and offer tasters where required. The staff are also keenly aware of the need to keep standards high with the quality of pubs in the city increasing year on year, the friendly competition along Goodramgate caters for all tastes and keeps all the bars on their toes! The kitchen staff not to be left out on the night contributed two dishes a chicken curry and a beef stew as well as plates of sandwiches so our party and the locals were well fed. Many thanks to them as they worked past their normal finishing time to ensure their offerings were served piping hot. This entry was posted in OB119, POTS, Presentations, Pub News and tagged Royal Oak on 25th February 2014 by York CAMRA.